It’s Friday and I have a Design Team project up on the Just Imagine Crafts Blog. For this layout I used some of my stash of scraps … all those bits and pieces left over from other layouts and cards. I punched a border strip using the Kreaxions 4 in 1 punch #311. The punched border strip just adds that little something extra to the layout. This week the challenge at Kaboodle Doodles is “ Buttons & Twine”. I don’t know how many times I have needed to wrap a gift only to find I was out of paper and/or tape. I’ve discovered that you can take a plain, ordinary, brown paper lunch bag and turn it into cuteness. I punched the top edge of the bag with the Kreaxions 4 in 1 punch #312 and then added a tag, a button and some twine. What a cute Christmas treat bag this turned out to be! To be eligible for the prize draw you need to be linked by Sunday, December 1st. One random drawn prize winner will receive 1 set of your choice from Melonheadz Illustrations. Oh how I love the Kreaxions Circle Cutter … the possibilities are endless! 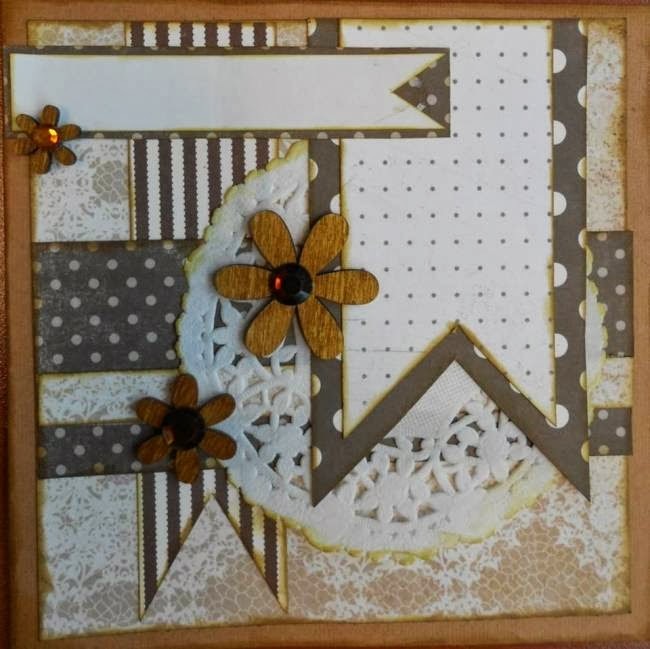 I cut the circles on the 12X12 patterned paper and then backed them with scraps left over from other projects. 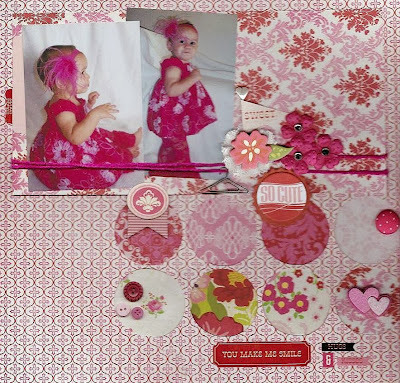 I went through my stash and pulled out all my pink embellishments … and viola …a very girly layout. Remember when I told you I had found a new favorite … Pillow Boxes!? I love these little boxes and the possibilities are endless. I made 10 of these little “Turkeys”. They will be filled with hand sanitizer and used for the boy’s teachers gifts for November. To be eligible for the prize draw you need to be linked by Sunday, November 24th. 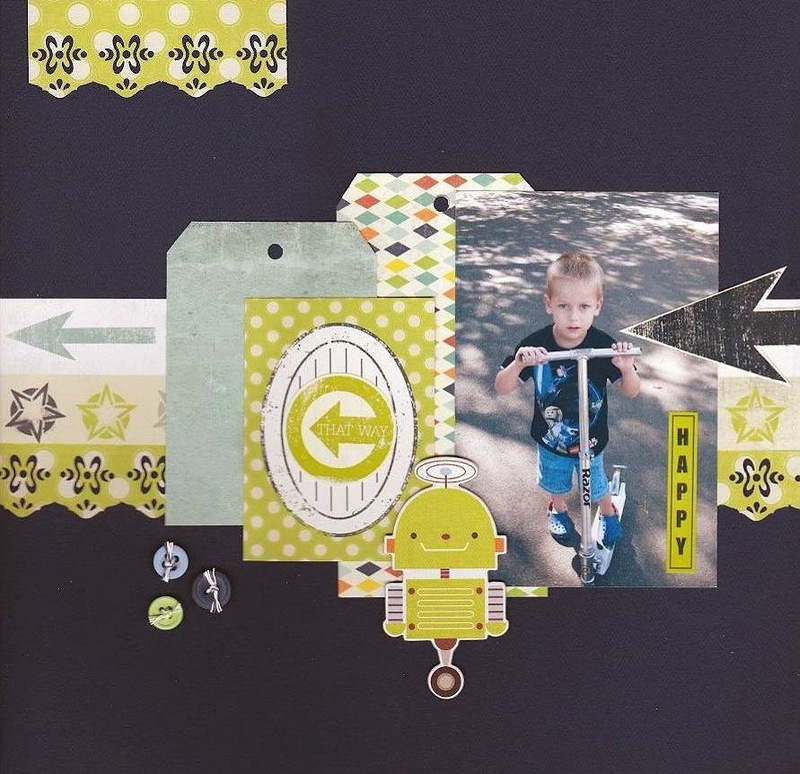 Do you have a favorite scrapbooking tool, one you love and that you find yourself using over and over again. I do and it’s the Circle Cutter from Kreaxions. I’ve tried a LOT of circle cutters and this one is by far the easiest to use! I created this cute snowman card using my favorite tool and my stash of cardstock scraps. I have the Wednesday Crash Your Stash Challenge at Turtle Soup today. What scrapbooker or card maker doesn’t have piles of cardstock left over from projects? Yes … we all do! My challenge to you is to create a project using up your stash of left over cardstock. No patterned paper allowed. You can use embellishments on your project if you like. You have the option of completing either a Layout, Card, Tag, ATC or altered project. I made a card and punched strips of cardstock creating scalloped edges. One random drawn prize winner will receive a $10 voucher from Di‘s Digis. There is a Design Team Reveal up on the Just Imagine Crafts Blog today and the theme is “family”. I completed this layout using a photo of Randy’s mom LaVerne and our daughter Jessica’s six sweet children. I don’t think LaVerne will be making any more trips to Florida with us and not knowing when Jessica and Aaron will be making a trip home again … well these memories are priceless! I punched the border strip with the Kreaxions 4 in 1 punch #304. I used the circle cutter to cut 1 ½” circles to make a scalloped edge. Be sure to check out the rest of the Design Team projects on the blog. I can’t believe it’s November! That means I need to get my Christmas cards in the mail by the end of the month. For this card I used the Kreaxions Star Template, and the Kreaxions 4 in one punch #312 with the “A” insert. I used the Kreaxions Circle Cutter (best circle cutter I have ever used) to create the green circle for the backdrop. I distressed all the edges and added the Merry Christmas SRM sticker to complete the card. Today I have the Thursday Scraplift Challenge up at Turtle Soup. I picked a card by Julg60. You can view her card in the gallery here. I LOVE all the layers. This is my take on the card. You have all month to complete your project. You also have the option of doing either a Layout, Card, Tag or ATC ... and with scraplifts you have the option to do this exact lift or share your choice of a lift and your example. Be sure to check out the forum for the details. This week the challenge at Kaboodle Doodles is “ Loved One”. I automatically thought of hearts. I think hearts say a lot without saying a word. I made this banner for my daughter's bedroom. To be eligible for the prize draw you need to be linked by Sunday, November 10th.